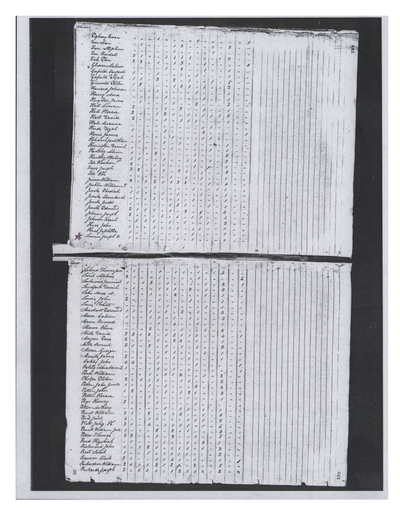 Historical or genealogical research in New England suffered from the basic spelling errors of an individual’s name. 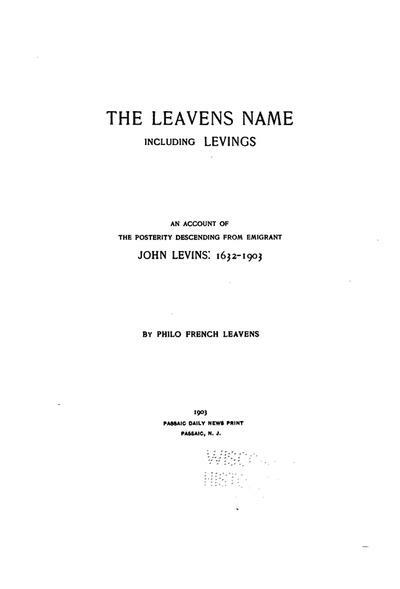 Consequently, the Leavens family history should be tracked under Levens, Levins, Levinz or Levnze and Leavens. 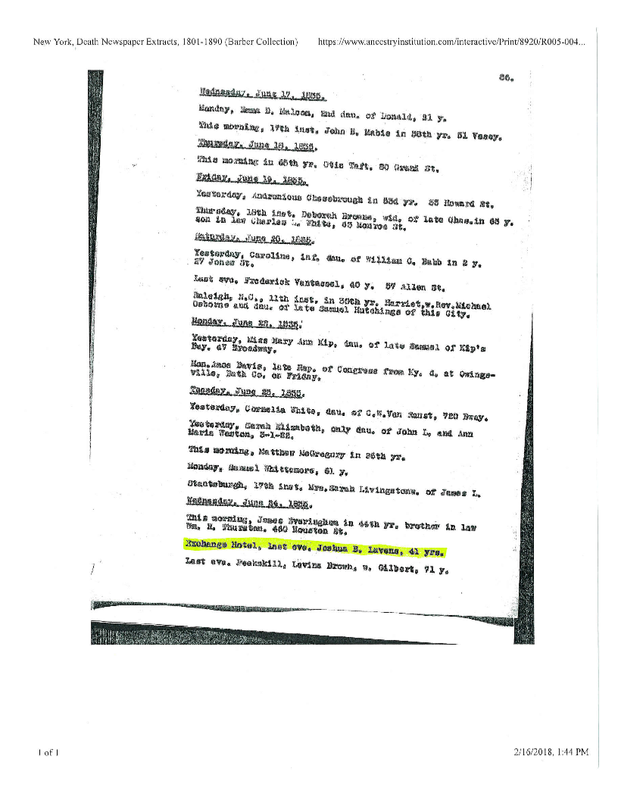 Though there were many Samuel St John family members, the Tuscaloosa bell donor was the first Samuel St John to consistently use his suffix of Junior on nearly every business document even beyond the death of his father. The St Johns had little difficulty with the surname in England. 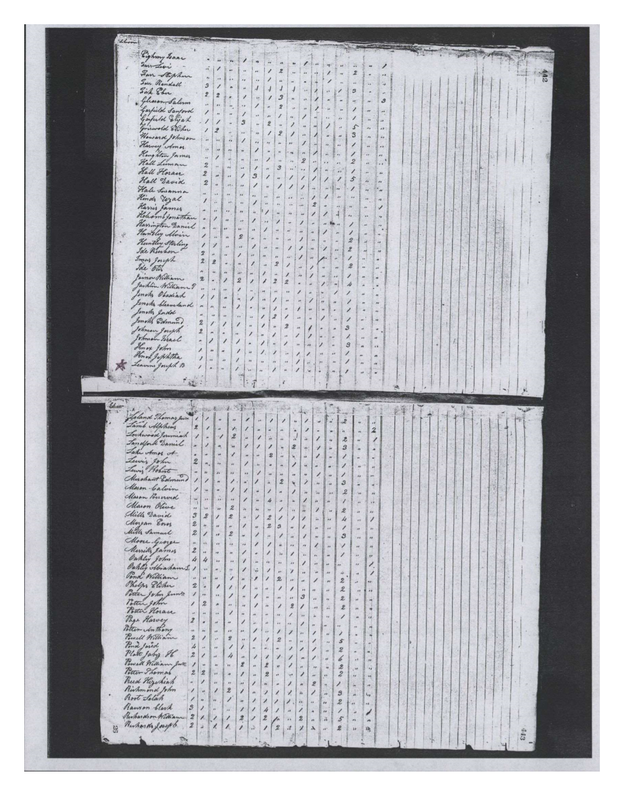 Typical of New England, seventy-two years after arrival in America, vital documents for the St John’s were recorded as Seation. Cotton was the source of wealth and connection to the New York City mercantile trade. 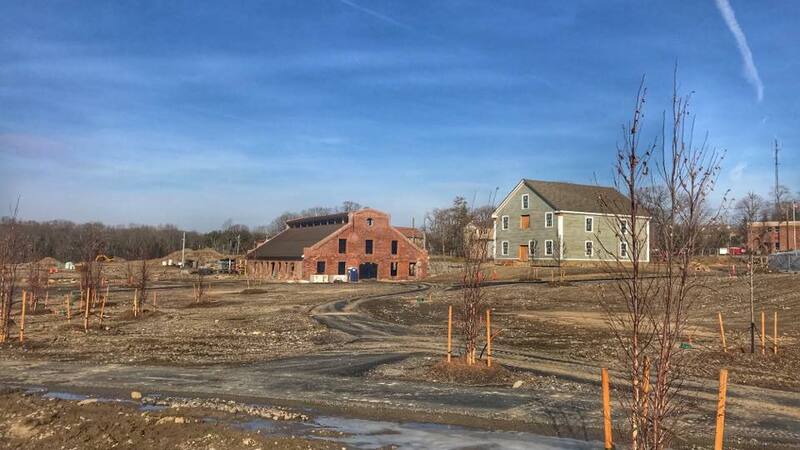 We cannot confirm the original capital that launched their endeavors though both Leavens and St John families had earned parcels of land each time they moved and settled unincorporated towns in New England. 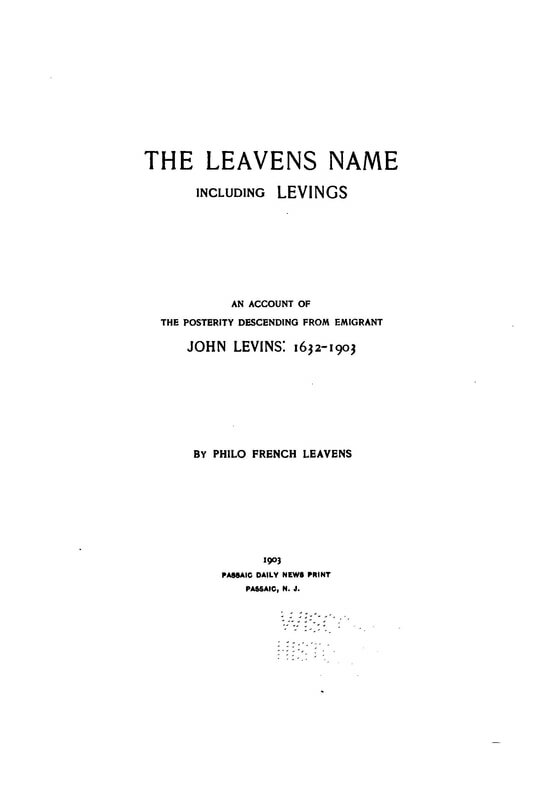 b. John Leavens, the earlier of the two immigrants, settled twice in Connecticut, once in Vermont and finally Granville, New York. The Leavens and St John families each generated over one-hundred and thirty surnames since immigrating to New England from Lincolnshire, England. 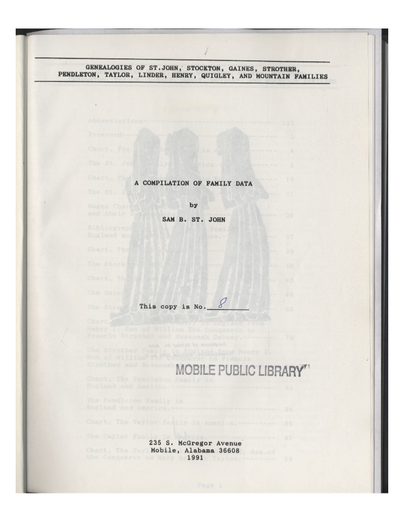 J. D. Beers, a New York Mercantile Bank with an office in Mobile appeared on related business documents. They may have been the partner's initial financial support. There is a family plot for the Leavens at the Church Yard Cemetery in Mobile. Joshua’s remains appear to rest alongside his wife, in the Glens Falls Cemetery, NY. See Images. Samuel St John Jr, his wife, and family, were domiciled in Norwalk, Connecticut, but maintained a home in Mobile. 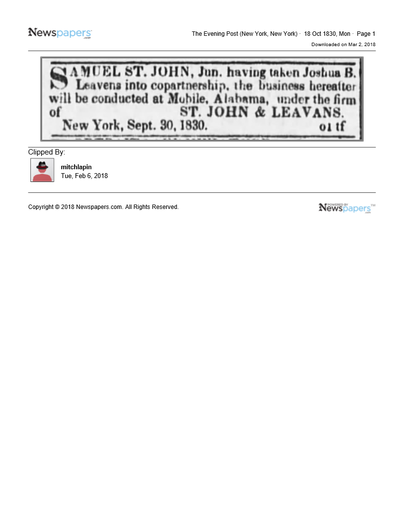 Samuel St John Jr commuted by steamer to NYC and Mobile on many occasions providing a business map of his endeavors. 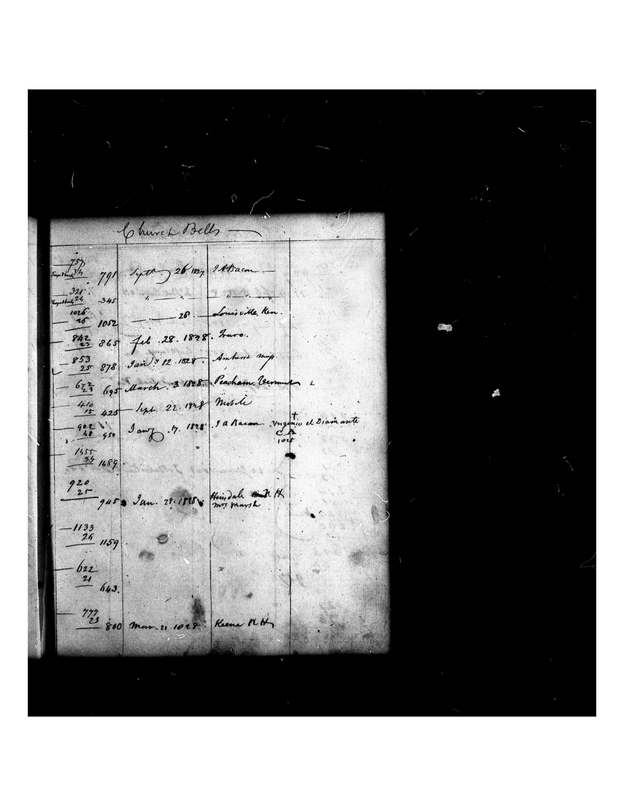 His movements were documented in numerous papers as he traveled by ship. We purposely have left off any punctuation marks after St and Jr as this was the predominant manner used in early New England. 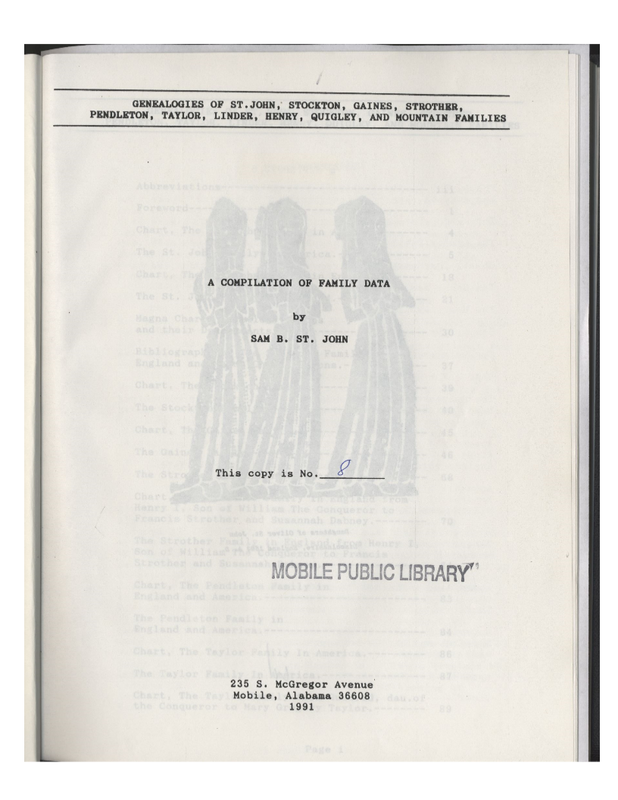 If you are drilling into the family history electronically, search by both St. Saint, Jr or Jr. with a period. 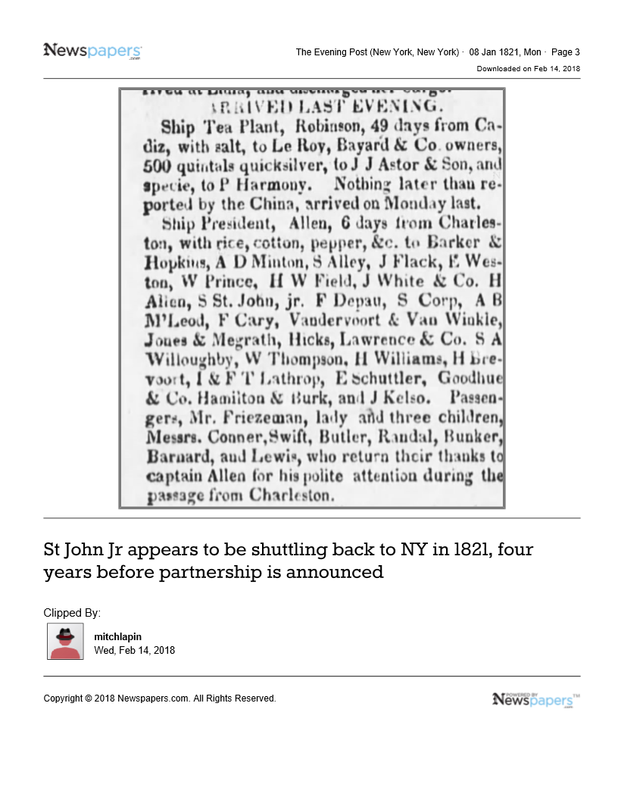 Searching by St John with no suffix will yield significant family history but very little of Samuel St John Jr.
Samuel St John’s first partner, Edward Griffith, died in the year 1824 in New York City. Joshua Leavens joined the establishment of St John Jr in 1825. Their partnership began in New York City, and by 1828 they had opened operations in Mobile, Alabama. 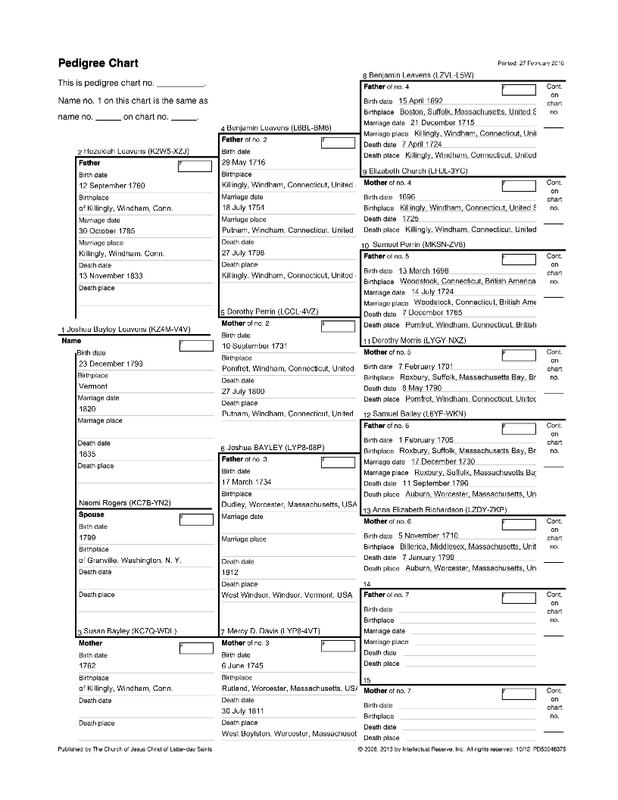 We have tracked their business and legal activity by newspaper announcements made in various regional papers. 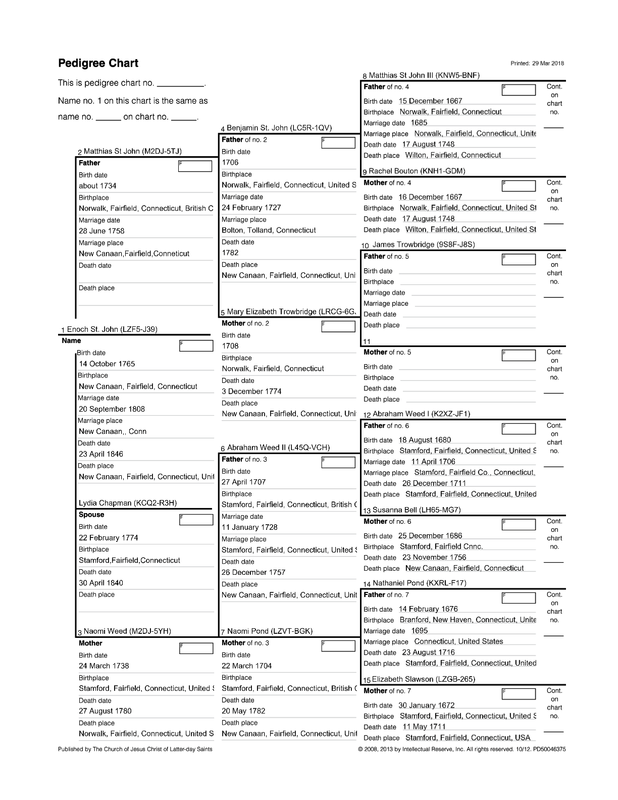 We have posted them in the image section at the end of this report. The clippings provide insight into a sophisticated legal and business environment. In our next paragraphs, we identify the two bell donors from their youth to their death. A family tree, of the sixth generation, for each partner is posted below. As well, we have linked, at the end, a passage to the original immigrants of both families back to 1632. Joshua Bayley Leavens, the bell donor, was born in Reading, Vermont December 23, 1793, and died July 25, 1835, in New York. New England History: Joshua’s grandfather, Benjamin Leavens, was born in Putnam, CT and died in Killingly, CT on July 7, 1798. 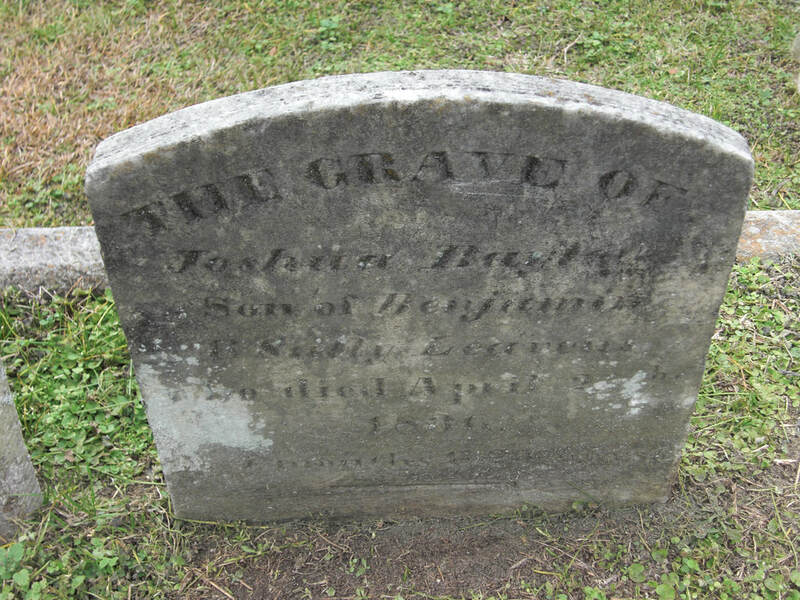 Joshua’s father, Hezikiah, relocated to Reading, Vermont before 1790 and died in 1833. His brother, Benjamin, was born on October 19, 1790, in Reading Vermont. His sister, Susan B., born in Granville, N.Y. October 10, 1797, married Lewis Hunt in 1847. Sister, Emily B., was born in Granville N.Y., January 17, 1804: died 1805. Joshua married Naomi Rogers in 1820. Their only child, Helen Naomi, was born June 29, 1821, in Granville, NY. 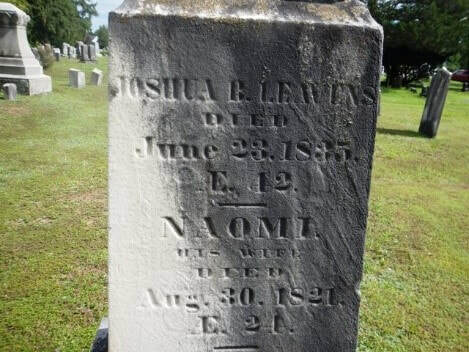 Naomi died soon after giving birth to Helen, on August 30, 1821.
from the United States of America, for a total of 320 acres in Tuscaloosa. The 10/4/1826, Land Patent was signed by President John Quincy Adams. 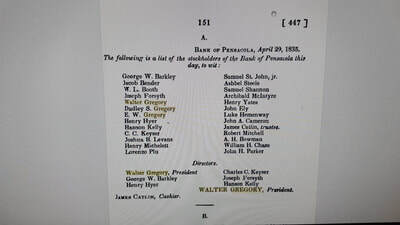 March 13, 1830, Joshua applied in a letter to Governor Gabriel Moore, of Alabama, for permission to invest $100,000 (with interest) in The State Bank of Alabama. ​a. 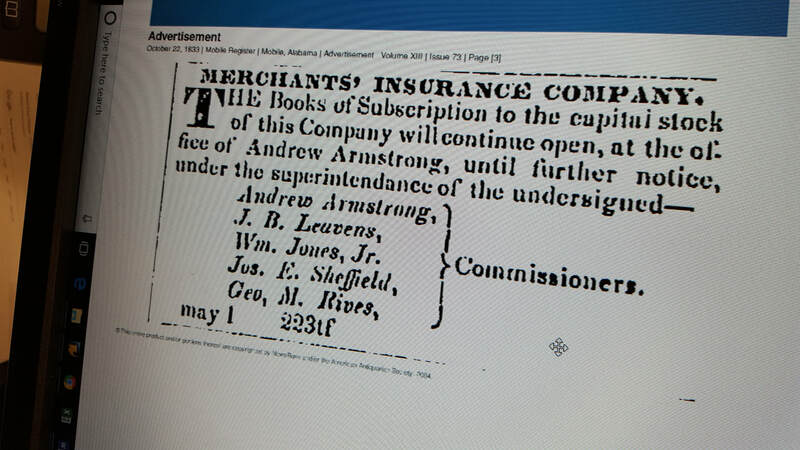 April 17, 1830, a letter to Governor Moore confirmed that $100,000 will be deposited in the bank tomorrow. b. Both letters originate from Tuscaloosa. 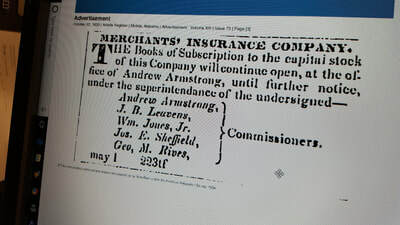 c. The bank was in financially distressed and Leavens, and J.D. Beers Co., restored their capital. 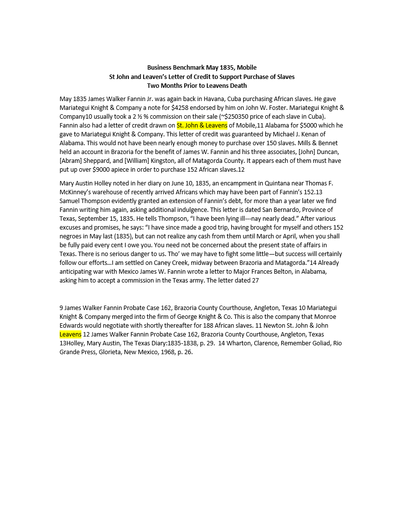 d. Five letters about the bank capitalization, from and too Joshua Leavens, with Tuscaloosa as the place of origin; but provide no specific address. Copies available on request. The Federal Census of 1830, shows Joshua residing in Mobile, Alabama. 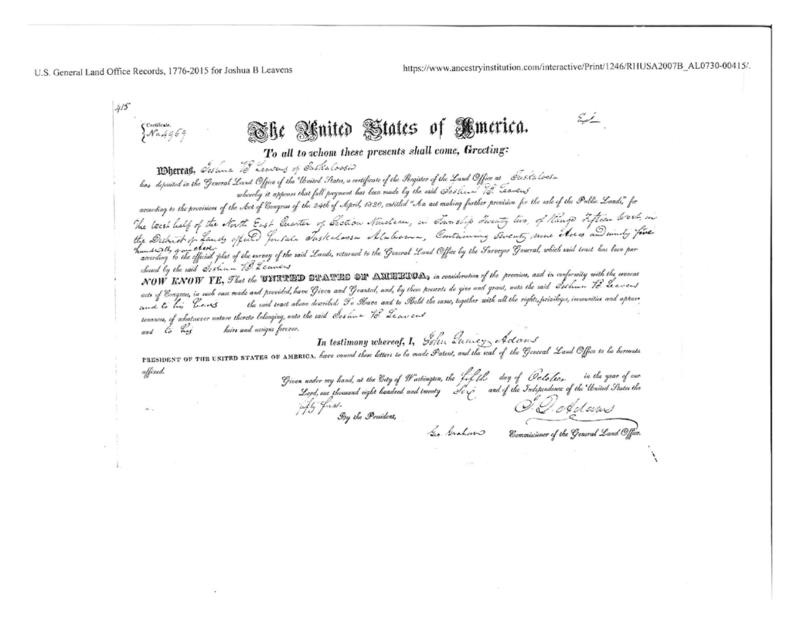 Of great mystery, on February 27, 1841, in absentia, Joshua received three new Land Patents from the United States of America, totaling 443 acres in Choctaw County: northeast of Jackson, MS. Some or all became the subject of a State of Mississippi, replevin in 1918. Additional real estate holdings in Illinois and New York, are noted in a Supreme Court of Alabama verdict to resolve Joshua Leavens debt due, C. Irby & Co.
On March 13, 1835, Joshua completed his last will and codicil acknowledging the immediacy of his health issues. The Flag of the Union of Tuscaloosa listed Joshua Leavens date of death as July 25, 1835, in New York. a. The date of death was June 23, 1835, according to the New York Death Extract., imaged below. b. 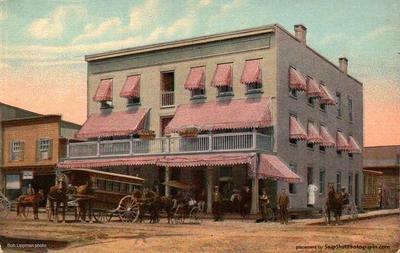 He died at the Exchange Hotel, in Saugerties, New York, on the Hudson River 108 miles north of New York City. 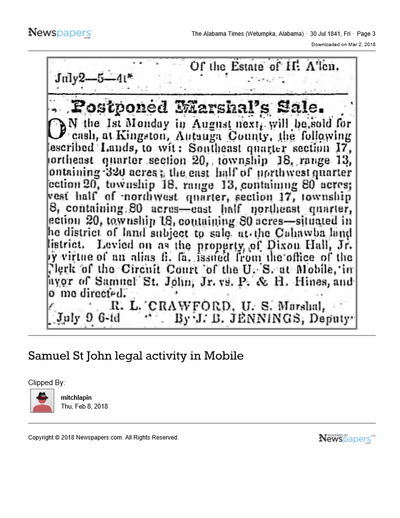 c. Official Mobile court records show Joshua’s will was probated on July 7, 1835. Imaged below. Surviving him was his daughter Helen Naomi. Aunt Susan Leavens Hunt raised Helen Naomi in Mobile, Alabama. Thomas Butler of Mobile married Helen, and their children were Pierce C. and Helen N. Butler of Mobile. We have not found a residence for Joshua in Alabama. 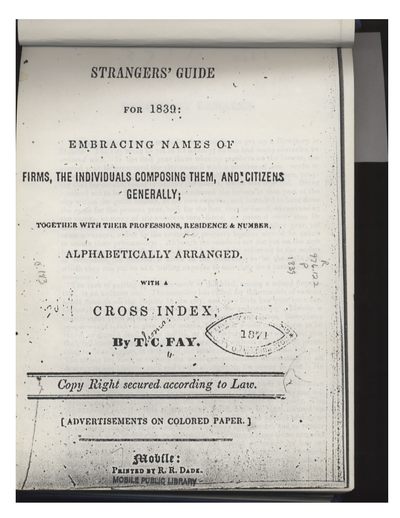 He does not appear in the Strangers’ Guide for 1839, produced by the City of Mobile and provided to us by the Mobile Public Library. If, he owned property, the title might have changed after his death. The Guide does list several Samuel St John Jr family members. 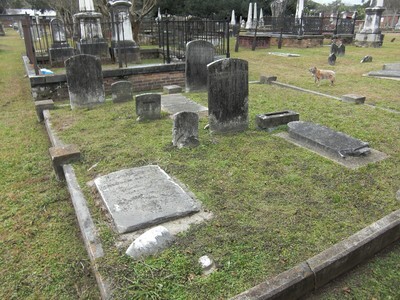 The Leavens family plot is at the Church Street Cemetery, Mobile, Alabama, and the marker for his wife and himself are in Glens Falls Cemetery, New York. Images are posted below. We have requested volunteers to revisit the family plot in Mobile to confirm the names and dates on the headstones. The States of New York and Alabama, respectively did not keep death certificates prior to 1847 and 1908. Neither the genealogy book nor family biographer noted the cause of death. Mr. Leavens had a warning of his death. Shortly, before, with the assistance of his partner, he re-arranged his estate and equity in his partnership. The first sentence of his will spoke to his ill health. A codicil was written May 18, 1835, to address real estate holdings. 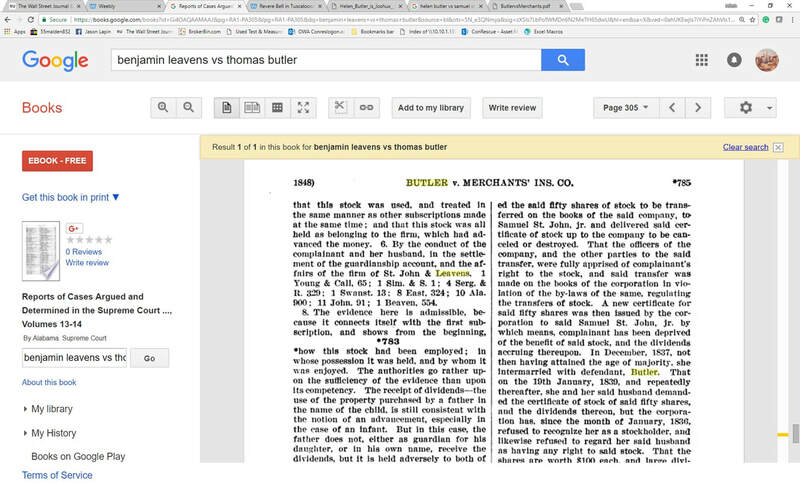 Six years later Benjamin Leaven, Joshua’s brother and Thomas J Butler for Helen Naomi Butler further contest the handling of Joshua’s estate. Helen was not yet of majority age. 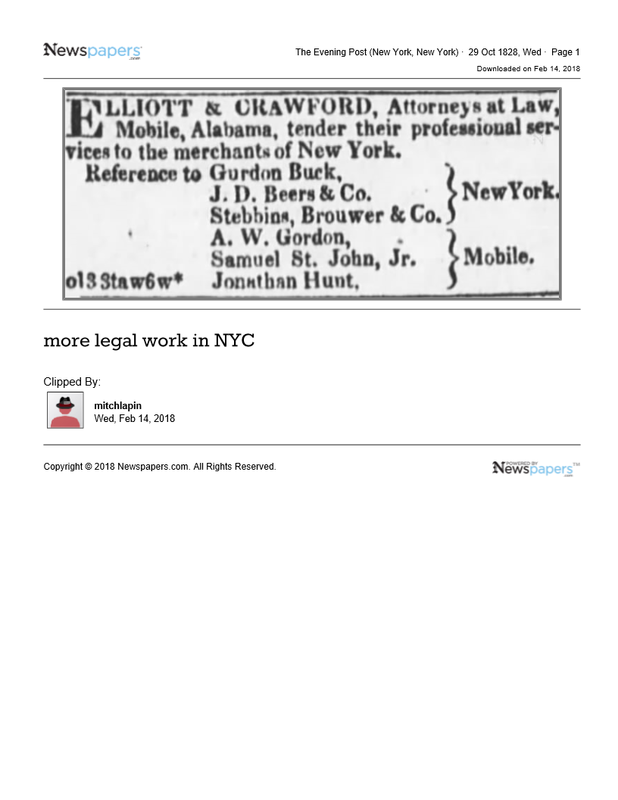 The issue involved a substantial sum owed C. Irby & Co. The initial district court ruling was contested to the Alabama Supreme Court. The Supreme Court reversed the lower court decision in favor of Helen and her husband, Thomas J. Butler. Links are available in our Sources. 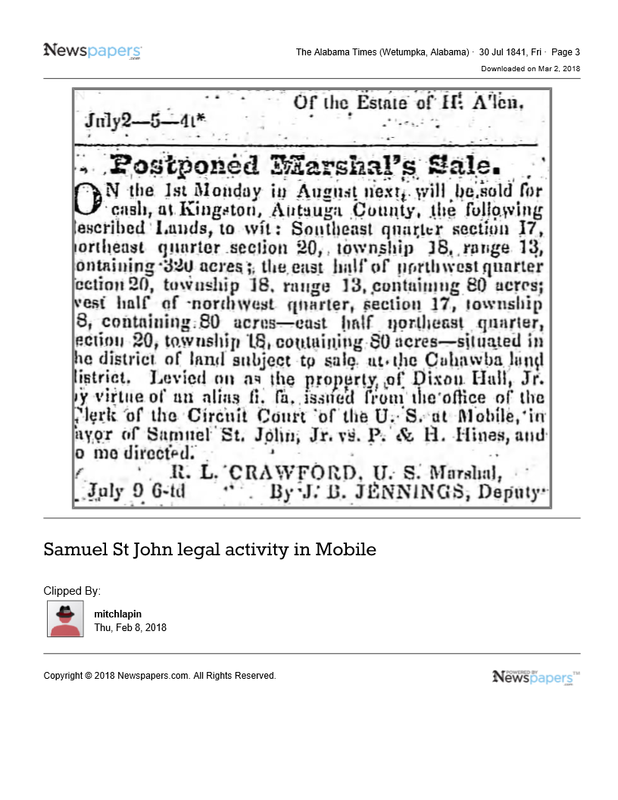 A third legal issue made its way to the Mississippi Supreme court in 1841 in a contest over the ownership rights to land at the time of Joshua’s death. Much later, in 1918, the State of Mississippi confiscated acreage and publicly notified parties of interest, including Joshua B Leavens. Samuel St John Jr, the bell donor; Born August 25, 1793, died July 21, 1866. Samuel was born in New Canaan, Connecticut. The family tree below runs back from his father Enoch to the third generation. 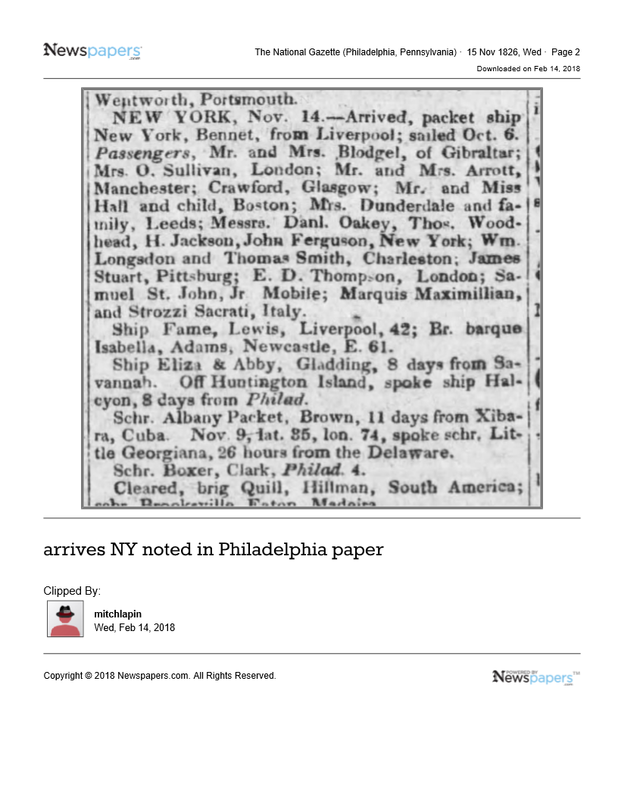 His wife Sophia Jenkins Williams was born in Brooklyn, Connecticut, on August 19, 1798, and on November 1826 they married in Darien, CT. (often Sophia's history will mistakenly suggest it was Brooklyn, New York.). Caroline G. resided in New Canaan, Conn.
Howell W. resided in New Canaan, Conn.
Sophia died December 27, 1855, at the age of 57 in Bridgeport Connecticut and Samuel died in New Haven in 1866. Samuel St John Jr is buried in the New Haven Historical Cemetery. 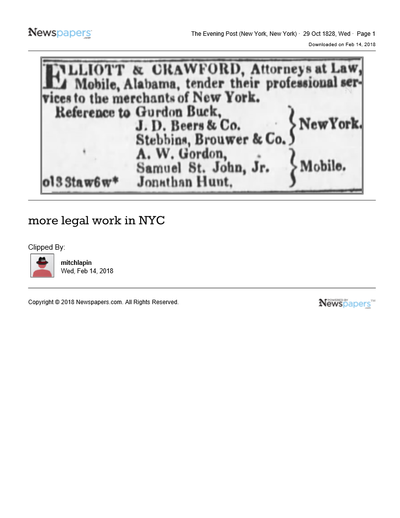 Samuels first Partner, Edward Griffith died in 1824, in New York City, creating a vacancy leading to Samuel’s partnership with Joshua Leavens. 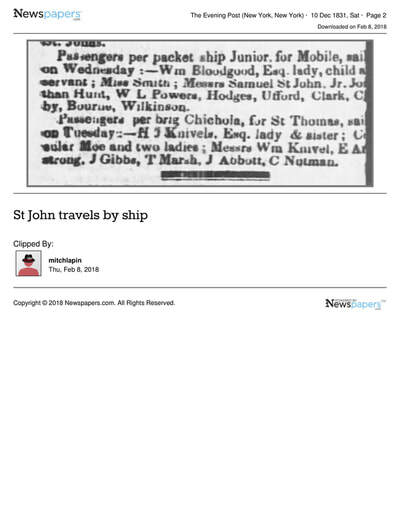 In 1839, the Mobile Street directory had Samuel St John Jr listed at 23 St Michaels St.. An image resides below. 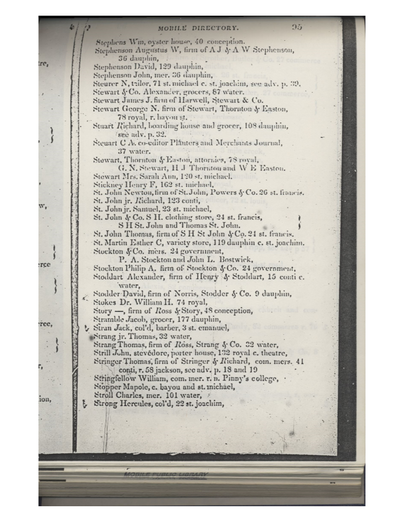 St John Jr, his son Newton, his nephew Thomas, conducted business at 21, 23 and 26 St Francis Street; see the town directory below. 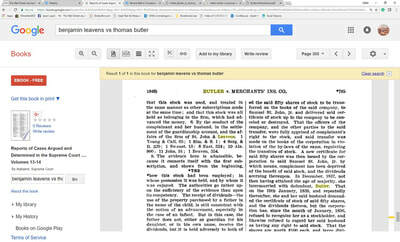 Newton was a partner in the St John, Powers & Co.
Thomas ran a clothing store at the same location. 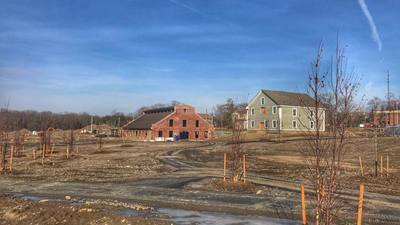 All properties on St Michael and St. Francis, today, appear to be parking garages. 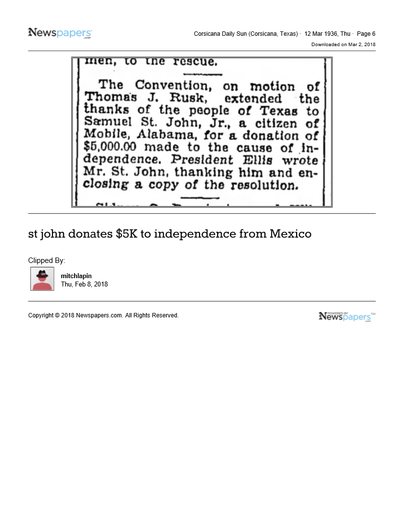 In 1835 and 1836, St John Jr donated $5,000, followed by $50,000 to the independence movement of Texas from Mexico, in support of Stephen Austin’s campaign. The economic depression of 1837 impacted the health of Samuel and the business. 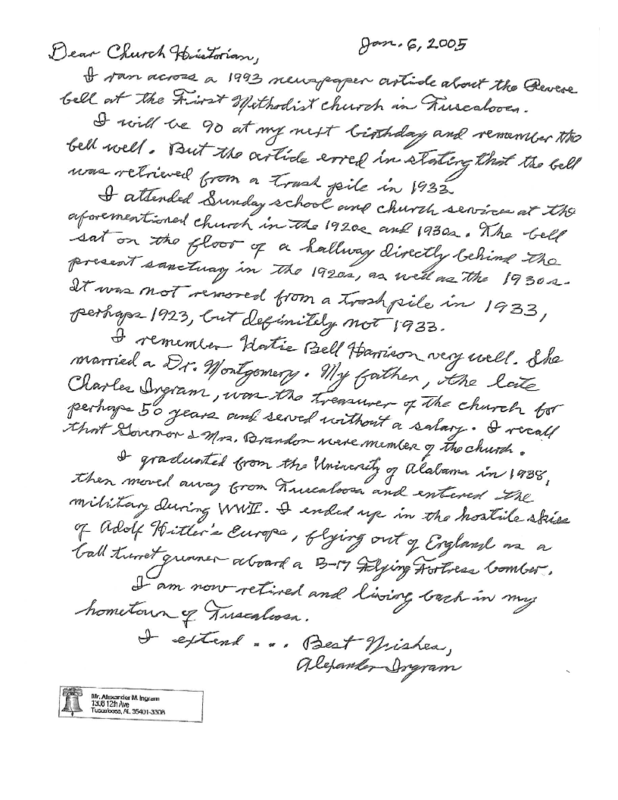 Mrs. Samuel (Sophia) St John Jr’s extensive obituary from the Quarterly Journal of the American Unitarian Association, Volume P. 649-653, reflected on her business, church, and family leadership. It is linked in our Sources. Located at the corner of Commerce and St. Francis Streets, Mobile, Alabama; upstairs. 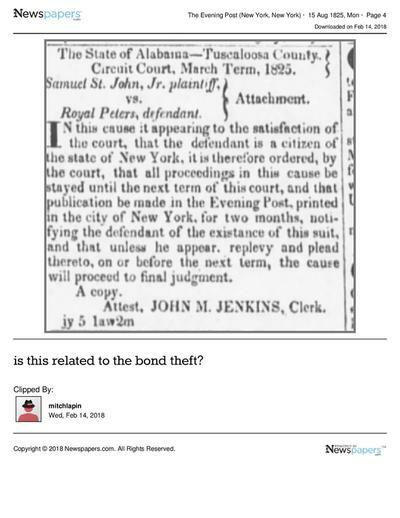 Through a theft of ten-thousand dollars in English Bank Notes and the police records, we have confirmed that Leavens and St. John Jr, traded in cotton and worked closely with the New York merchant bank of J. D. Beers and clients in England. a. Several newspapers, from Tennessee, New York, South Carolina and Alabama reported the swift police work at recovering all but one-hundred dollars. b..The felon was a Mobile, Alabama postal official and had a weekend head start but could not out-run the dogs. 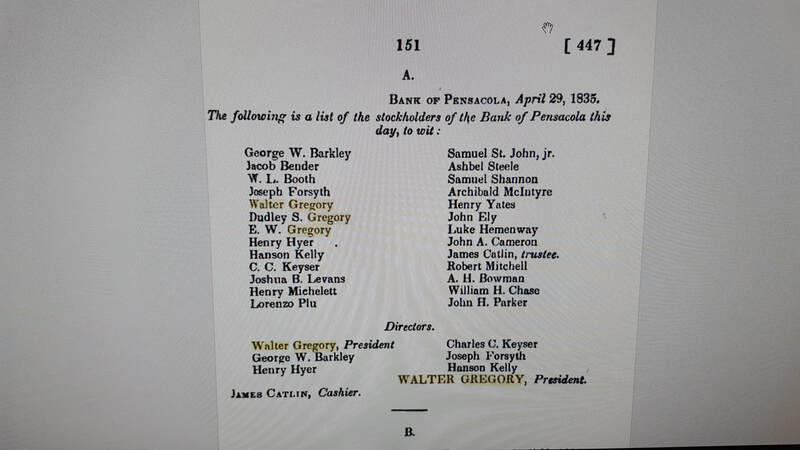 Both partners bought stock to capitalize the Bank of Pensacola. 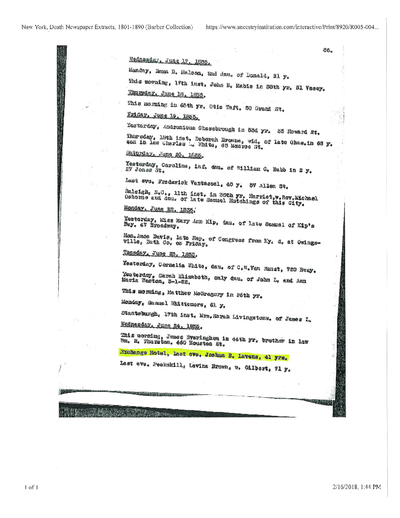 See page 38, for the Congressional Record noting and approving the bank, its officers, and stockholders. Ownership of a bank in this period required the Congressional and Presidential approval of the bank’s charter. The partners insured business transactions. A clipping speaks to their endeavors in Mobile. a. Quite entrepreneurial, selling Merchant’s Company Insurance to business’ to cover risk and then selling stock in the same company to the public. b. Advertisements to both effects are in the Image section. 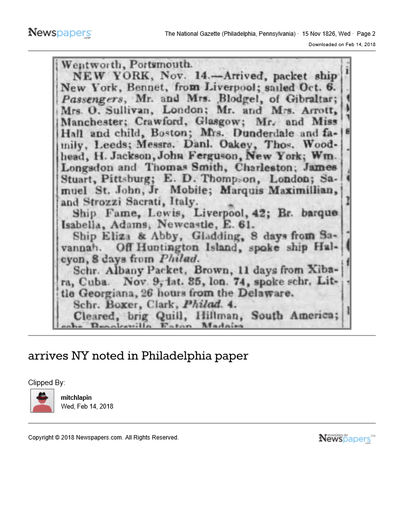 Additional sources of income for Joshua Leavens were booking freight for cotton, or passage for individuals on steamer ships. 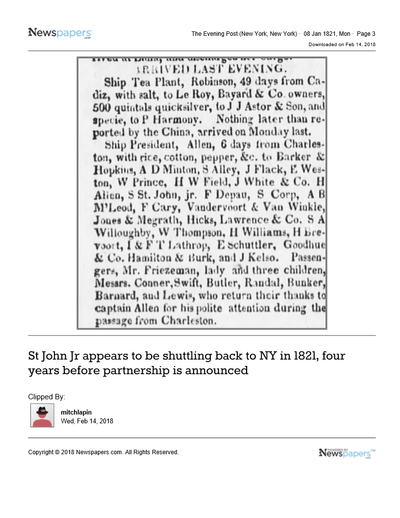 The partnership seemed to have helped resolve a debt for the purchase of slaves, see the clipping and further linkage. Mouse over the attachment to read post-it notes. This link provides the bells history in the 20th and 21st Century. 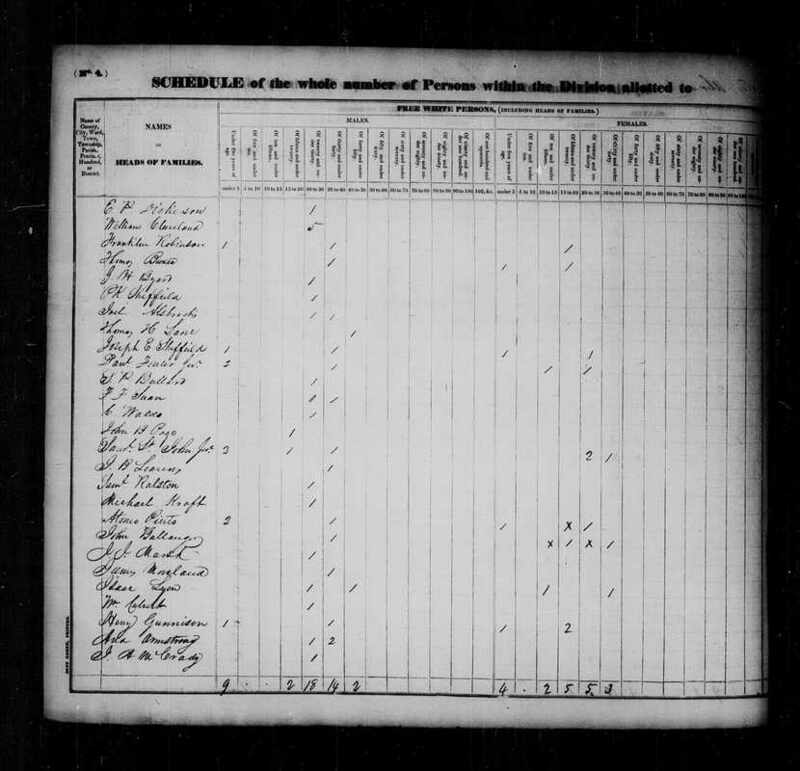 Census of 1830 for Mobile, Alabama, showing Joshua Leavens as a resident. Notice of Leavens death in Saugerties New, York hotel, courtesy of The Alabama State Archives. Notice of his death. Date is approximate, as noted by the abbreviation ult. Exchange Hotel. Leavens died here June 23, 1835, evening. Hotel is still in operations as of 2018. A Marker in the family plot in Mobile, Alabama; probably not his actual place of interment. Joshua's wife died 1821, Joshua appears buried next to her in 1835, in the Gens Falls Cemetery, NY. Samuel St Johns obit, suggests he donated another $50,000 to the cause of Texas independence; 1836.
. 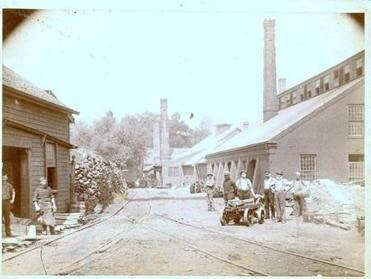 The Bell was cast in the Revere foundry on the left. 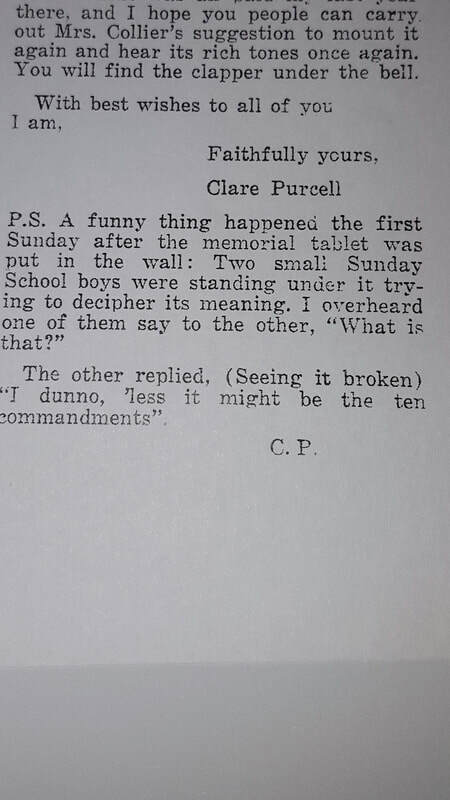 in 1922 the commenmorative tablet was being repaired and brought on this humorous comment. One of many endearing relationships between the Revere Bell and the First United Methodist Church of Tuscaloosa. 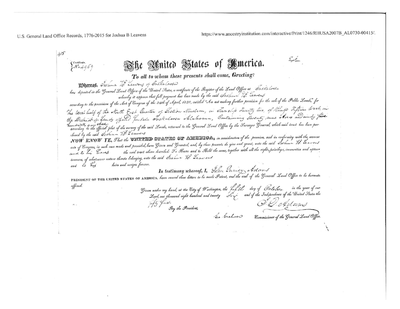 This Land Patent awarded to Joshua Leavens was signed by John Quincy Adams, President of the United States. Legal action by St John in 1841; appears to be land Patented to Joshua Leavens in Choctaw County Mississippi. In 1918, Mississippi included Joshua B. Leavens in a land replevin action. 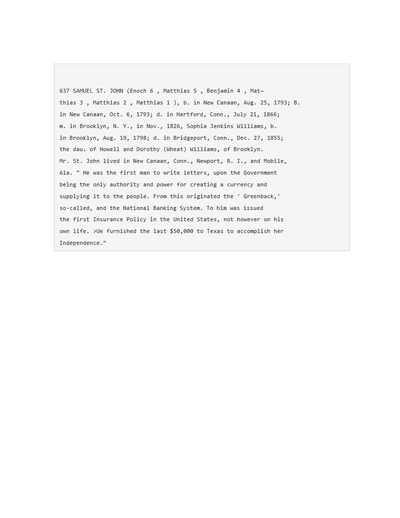 Congressional Record authorizing the Bank of Pennsacola and its owners. The theft from the partners of $10,000, was national news. This article in the Nashville paper. 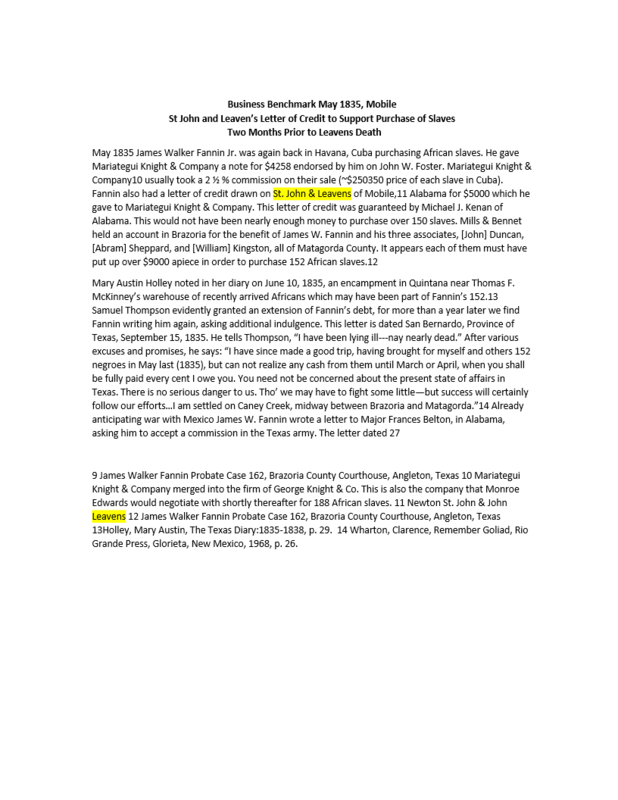 The partners underwrote the purchase of slaves with a letter of credit in support of James Walker Fannin Jrs’, Texas plantation. Fannin’s wife, Sarah Weekly was raised in Mobile. This legal action in Tuscaloosa County Court against a debtor in New York, confirms St John was a resident of Mobile by 1825; Courtesy, The Evening Post of NYC and Newspapers.com. 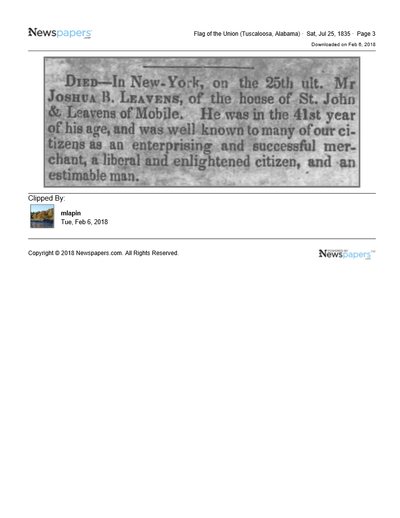 76 years later Joshua B. Leavens in named in legal action by State of MS.
​Joshua B. Leavens, last will and testament is available by clicking on this line. March 1835. 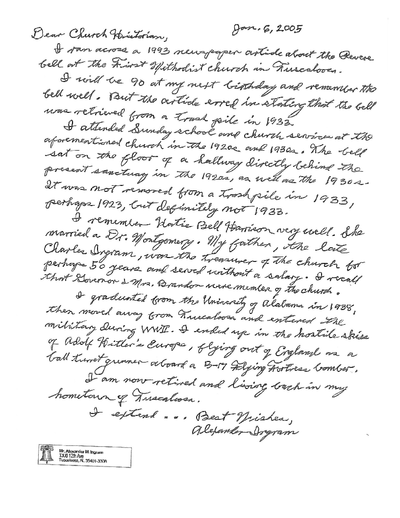 St John Jr's, genealogy based on his trustee's written commentary at the reading of the will.
 . There may be a historical answer. The British invaded from Canada via the upstate New York waterway of Lake Champlain to split New England from the rest of the United States. The waterway runs for miles abutting New York State on its western side and Vermont to its east. The Governors of Vermont, Connecticut, and Massachusetts did not commit their militias to defend New York. Contentiously, all three governors believed they were chartered to use the militia only to defend their state. In truth, New England was lukewarm on the war as the prominent issue of “impressment” had been resolved in writing before the beginning of combat. Additionally, local commerce with England was substantial. Thirteen years later, the United States Supreme Court overturned the Governors’ opinions. 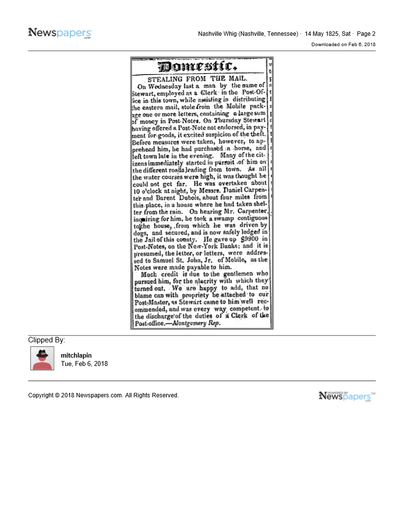 Under the circumstances, patriots made their way to New York to serve in the war. A land patent is made by a sovereign state or federal government to a tract of land to individuals or private companies. The term patent means it is permanent, forever. In the case of Joshua Leavens’ patent the land was unoccupied as Mississippi became a state and the land became the property of the United States as part of the bargain. The President of the United States must sign-off on any land patent. https://archive.org/stream/leavensnameincl00frengoog/leavensnameincl00frengoog_djvu.txt Identical to above but in raw text that can be copied; compliments of Google. 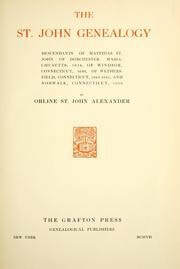 https://archive.org/stream/stjohngenealogyd00alex/stjohngenealogyd00alex_djvu.txt St John genealogy in simple text format from Google. https://books.google.com/books?id=6j8AAAAAYAAJ&pg=PR1&lpg=PR1&dq=quarterly+journal+of+the+American+Unitarian+Association,+Volume+3&source=bl&ots=M1b0xW4i5G&sig=bjz8OFrq-sKkX2TdaAMZ1OUupgo&hl=en&sa=X&ved=0ahUKEwi--aq0w7zZAhVDnlkKHfcmDAUQ6AEIPTAE#v=onepage&q=St%20john's&f=false startng on page 380 Printed by the American Unitarian Assoc., available online from the Harvard University Divinity School. https://books.google.com/books?id=Gi4OAQAAMAAJ&pg=RA1-PA305&lpg=RA1-PA305&dq=benjamin+leavens+vs+thomas+butler&source=bl&ots=5N_e3QNmya&sig=zXSls7LbPofWMDn6N2MeTH65dwU&hl=en&sa=X&ved=0ahUKEwjIs7iYiPnZAhVIs1kKHdnsACQQ6AEINjAE#v=onepage&q=benjamin%20leavens%20vs%20thomas%20butler&f=false Thomas and Helen Butler, vs Merchants Insurance Co.